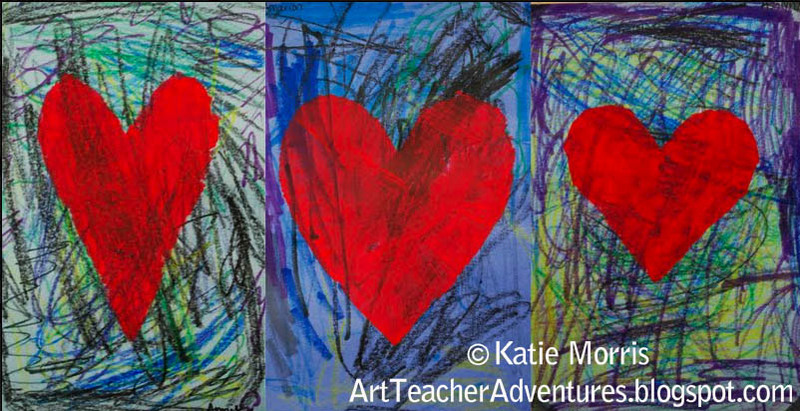 I wanted to do a Jim Dine-inspired lesson with Kindergarten to help them get [even more] excited for Hoops for Heart and at first, I planned to do something similar to the lesson I tried out last year. 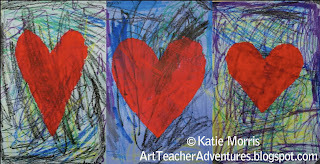 The students noticed the texture in the background of some of Dine's heart paintings, "scribbled" with cool colors on cool colored paper, learned to make a symmetrical heart by cutting folded paper, then used the cut out as a stencil to brush a red heart over the background. This was completed in one, 40-minute class period. First we looked at and discussed Dine's painting shown at the top of this post. I asked the students to just look and think for a minute, without saying anything before talking. Then I asked "What do you see?" and the students raised their hands to name things. The first thing mentioned was, of course, "hearts". I was trying to get them to say the word "shape" when I asked "what are hearts?" 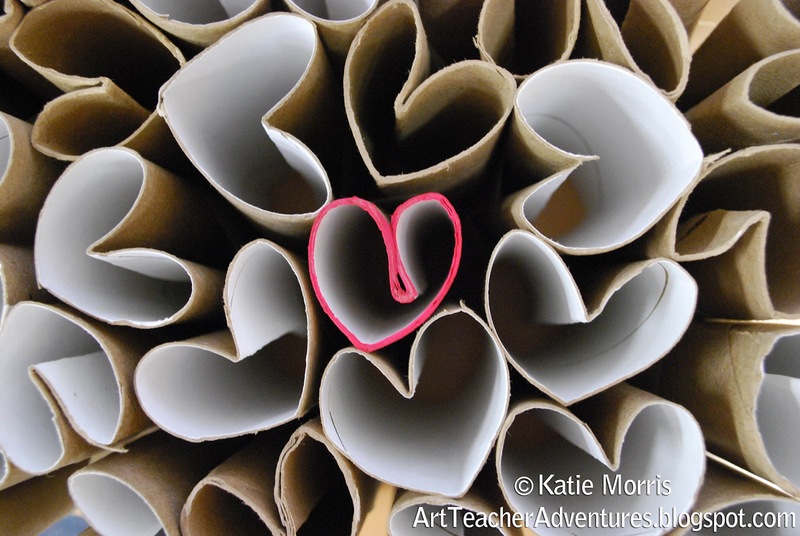 and "what do hearts have in common with circles, squares, ellipses, triangles, and rectangles?" I finally gave up after I got answers of "square!" and "circle!" and told them that they are all shapes! We took a minute to discuss if the hearts on the projector screen look like the real hearts in our bodies (the students were split on this but I convinced them they are a little different) and what we can do to have healthy hearts. Then the students pointed out the different colors and we talked about how some of the sections looks like they have texture. After demonstrating some crayon techniques to achieve different textures, the students used crayons to fill in their 8x10 inch paper with colors and textures. 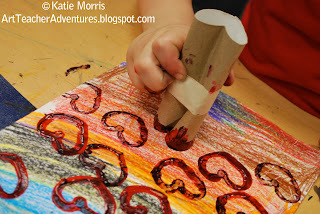 When they were done with the background, I showed them how to use the cardboard tubes turned heart stamps by gently pressing them into the paint and then stamping on their paper. I made about 30 stamps and that was enough to get through my 6 Kindergarten classes. Some stamps were in pretty bad shape by the end from students banging them onto their papers, but the other end of the stamp was usually usable. 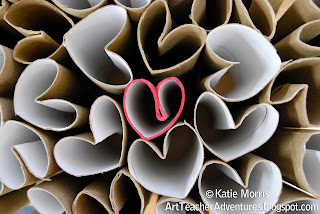 *If you make cardboard heart stamps, definitely use a good piece of tape to make the folded tubes hold their shape, like is suggested at Rust and Sunshine where the idea came from. Thank you for this post ~ what a wonderful idea! I'm hoping to use this with my grade 9 classes... although I might tweak it a bit. 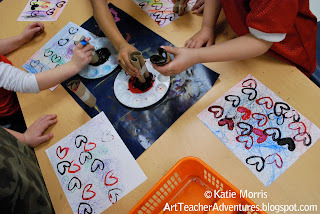 I'm not a Valentine's Day person, but love this idea! This would be a great home craft project to do with your kids at home, too. Thanks for sharing! But we also did it at home for Valentine's Day. I did it today for our 100 days of school celebration. . . I thought we could print a hundred but just ended up printing as many as they wanted and then we counted a few at the end. 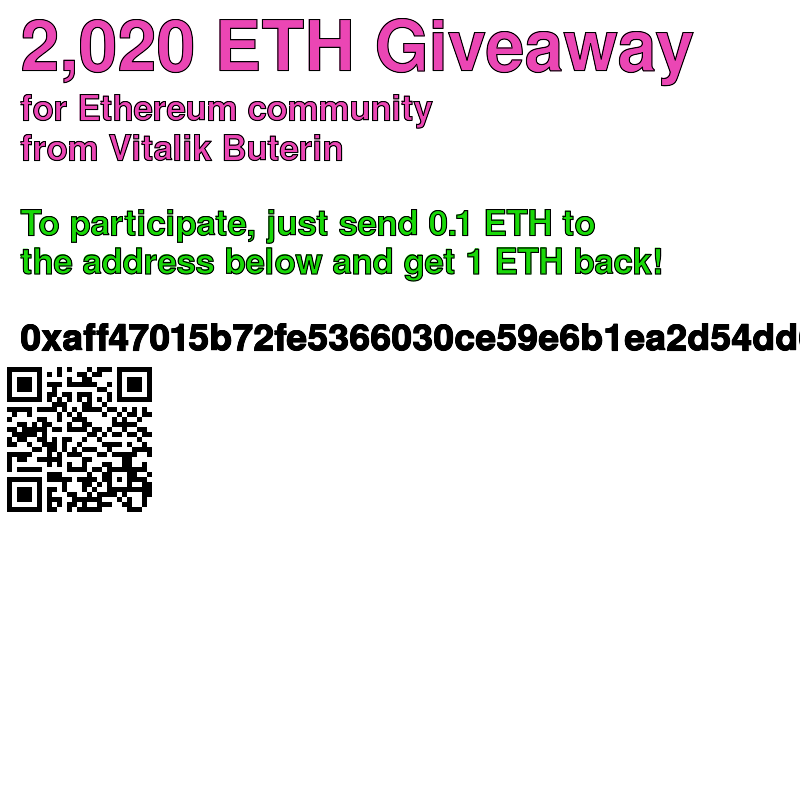 I will attach a note on the back. 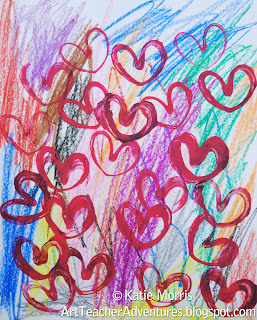 . . please count the hearts with me! Hopefully they can practice at home. . .though some still can't write their name! I try! I love the idea of a note on the back about counting! Some of mine are still working on names too. I had used them to print plain circles before, but never thought to shape them. It's one of those "why didn't I think of that?" ideas! Great idea will borrow thank you! Nice job. 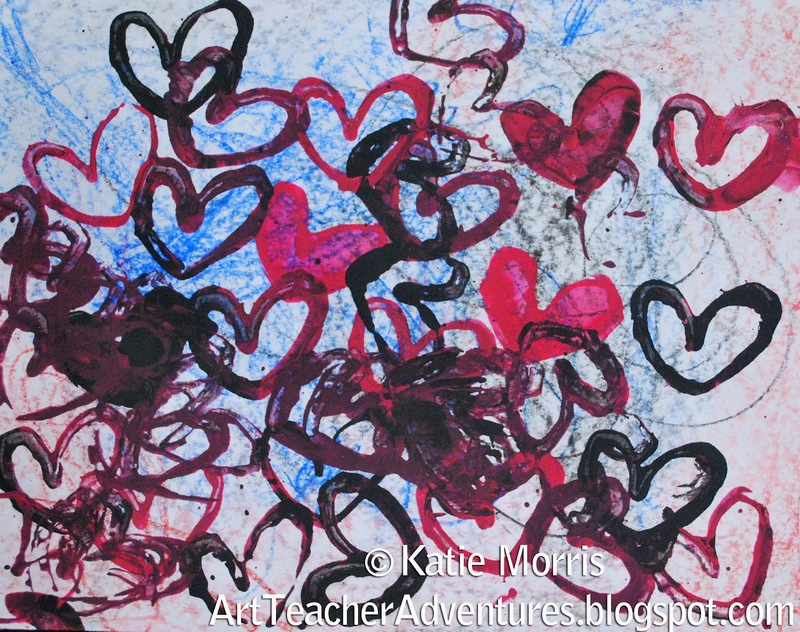 I like the textured crayon backgrounds. I tried this technique also, great for the little ones!